If your only experience for eating beets is from a can around Thanksgiving time, you are really missing out. There is a wide variety of great tasting beets to choose from such as Golden Detroit to the Ruby queen and this doesn’t even include the beet greens which are also edible. Beets are a great root vegetable that easy to grow, so as long as the soil you plant them in is friable, meaning loose enough to allow the root, which is the actual beet itself, to grow and expand. If your soil is heavy on clay, you may have issues. A quick fix is to add in plenty of peat. Although the use of peat as of late, has been deemed, not environmentally friendly. If that is a concern to you, you can substitute peat with “coir”. Coir is fiber from the outer husk of coconuts. Beets like to grow in neutral soil, so be sure to take a pH reading so you can make adjustments as necessary. I like to use a specific small raised bed for the beets that I grow. It makes it easier for me to maintain. Don’t plant your beet seeds more than a half inch deep. While they are a small to medium sized seed, that depth will be perfect for your needs. You can start your beet seeds indoors to get a head start of your gardening season. This comes in handy if you have a short growing season. When you make the transition to the outdoors, be sure to give them plenty of room, both width and depth as some beet roots can extend as deep as 3 feet! Follow the instructions for spacing on your seed packet as it will vary based on the variety you are planting. Lean towards the side of further apart then closer together. For example if your seeds packet reads, space out two to four inches, go with four inches. Although beets will grow in partially shaded environments, they really do best when in full sun. But, most of everything you grow in your garden thrives best in full sun, so that should be a given. If possible be sure to harvest your beets when they are about 2 to 3 three inches in diameter. You will see them start to pop out of the ground from the top, similar to what onions do. At this size you get the best flavor. In my personal opinion, any larger and they start to become too bitter. You may, however, like the flavor, so be sure to grow them to your tastes, not someone elses. I was reading an excellent article the other day by fellow vegetable gardening enthusiast, Gardening Jones. The article titled, Blanching Veggies was about blanching the peas from her harvest. This got me thinking about the basics of the blanching process in general. What is blanching? How do you blanch? Is it worth it? Those sorts of questions. In that same article above, there is a link to an excellent piece of information about blanch times for specific vegetables, titled Freezing the Harvest. Be sure to bookmark this link as it will come in handy, once you read below of the importance blanching plays with your own harvest. So first, let’s start with understanding what blanching is. 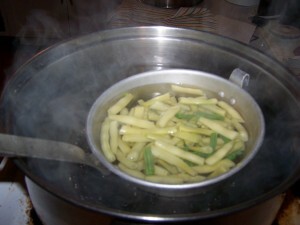 Blanching is the process by which you plunge your fruits,nuts,vegetables, etc. into boiling water for a short amount of time, then remove it and immediately plunge them into an ice water bath stopping the cooking process in its tracks. It is a very simple process but you may be asking, why you would want to do this. While many blanching professionals have their own reasons, there are a few popular ones that relate directly to us home vegetable gardeners. As you may know already from growing your own food, that many varieties, such as peas and beans are going to yield great production. From the moment that you pick them the process by which the veggie starts losing flavor, vitamins, freshness and so on begins. Unless you are going to use them right away, you can blanch them to preserve all of those previously mentioned characteristics. Blanching your veggies is going to keep them crisp as opposed to “mushy” when you cook them, which makes them taste very fresh. Blanching, especially when it comes to tomatoes, will soften the skin, making them easier to peel, which comes in very handy when you begin canning all of those extra tomatoes you are growing. For us vegetable gardeners, blanching is very important, especially when you go to freeze those veggies. If you harvest your veggies and vacuum seal them without doing anything, place them in a freezer and then come January when you take them out to use, as they thaw they will become soggy. Believe me there is nothing more disgusting then eating soggy carrots. By blanching them first, you will help preserve, the flavors and texture and just as important, the nutrient content. As a side note, blanching makes it easy to remove peels from peanuts and almonds. I just recently planted an almond tree, so I just had to mention it. On the final question of, “Is it worth it?”, my answer would be absolutely Yes! Just think, how many beans you will get from a handful of plants. You know what I am talking about if you have grown beans. Blanching gives you the ability to enjoy fresh beans all winter long, when growing them is no longer possible. For more information on how you can keep and preserve more of your harvest, be sure to check out Nancy Chioffi’s book Keeping the Harvest: Preserving Your Fruits, Vegetables and Herbs (Down-to-Earth Book) , which is an illustrated step-by-step instruction book that explains the techniques for canning, freezing, drying, and pickling. There’s the Golden Wax, harvester and Royal Burgundys. These are three of the many varieties of Bush Beans available to grow at home. If you have never grown bush beans before you are really missing out. They are easy to grow and have a high yield per plant. Best of all they are extremely easy to start from seed, and that means, you will save money on your food bill. Bush beans as opposed to Pole Beans (I’ll talk about them in my next article), are determinate. That means they will grow to a certain size, stop growing, then start producing. This allows you to know exactly how much space you will need per plant. Bush bean plantings have a harvest window of about 10 days. So when planting them, make sure you space out your plantings every so many days. This gives you a constant supply of beans throughout the season. Bush Beans are fairly large seeds and that means you can plant them deeper than many other seeds that we have talked about thus far. One inch is perfect, but I have gotten away with as deep as two inches. Try to keep it within that range though. 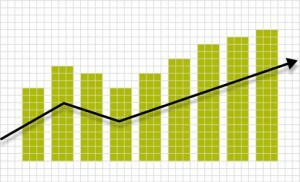 Is your soil temperature in the seventy-five to eighty degree range? If not, it’s not the end of the world, nor does this mean they won’t germinate, however, at this range, you will find that your bush beans will pop up in as little as seven days. Maybe sooner under optimal conditions. 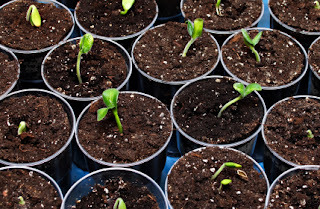 The jury is still out on whether or not to start your bush bean seeds indoors or simply wait until you can sow them directly into your garden when weather permits. I personally have had success using both methods here in New Jersey. If your growing season is short on time, then by all means start indoors to give your garden a head start. Keep your soil neutral...the pH range that is. Bush beans grow best, in my own experiences, when the soil is around 6.5 to 7.0. If your soil is too acidic, add some crushed powdery limestone. Too alkaline and use a good organic fertilizer that adds acidity to your soil. My bush beans have grown best when exposed to a full day worth of sun and weekly steady watering. By steady I mean 15 minutes under the sprinkler, first thing in the morning as the sun is rising. Depending on the variety of bean (follow the back of your seed pack), harvest your beans when they reach their full plump size or length. Picking them right before you are about to consume them will give you the best tasting most full flavored bush beans you have ever eaten. If you practice crop rotation, which you should, you are in luck. Bush beans get along with just about every plant out there. I love asparagus. It can be eaten raw in a salad (or by itself), steamed or my favorite, grilled. Growing asparagus from seed has but one drawback, that would be, the time investment it will take before you can harvest it. 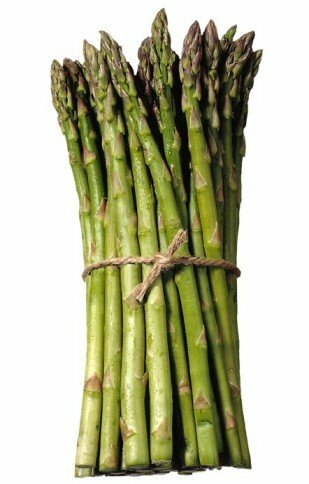 The average harvest time from the moment you plant the seed until the asparagus is on your dinner plate is three years. Yes, you read correctly, three years. With that drawback however, the bright spot is that asparagus is a perennial. Meaning, it will come back every year for fifteen to twenty years! If you want to bypass starting it from seed, you can do that, as your local garden center more than likely sells asparagus crowns. Just be sure to read the package to see the age of the crown. If you are looking to get asparagus in your first season, you will want to choose a package that reads “3 year” or “3rd year” (these are not that common to find). It may also read something to the effect of “asparagus in first season”. But if you are like me, in no hurry and enjoy the challenge of starting vegetables from seed, then read on as I outline some tips to make sure the time invested produces wonderful results. As with any other vegetable, give your asparagus seeds a head start by germinating them indoors in fertile seed starting soil that is seventy to eighty degrees Fahrenheit. 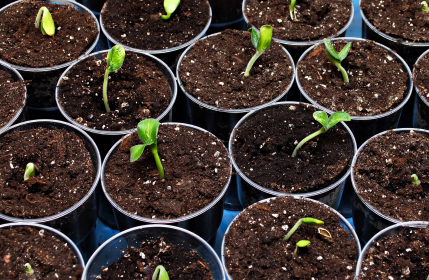 Regardless of which method you use to start your seeds, expect germination to average ten to twelve days. Be sure not to plant your seeds any deeper than one quarter of an inch. You may be able to get away with a half inch, but a quarter will be plenty. When spring rolls around and outside temps, especially at night, stay above fifty degrees Fahrenheit, then it’s time to move them outdoors where they will remain for the next twenty years. So be sure to choose a good location for them. They are going to be there awhile. The location you choose should receive sunlight eight hours per day. Asparagus, however, will tolerate partial sun, but make sure they get at least a minimum of four hours per day. You should have already prepared the spot long before your asparagus starters are ready to move. What that means is, the pH of your soil should be 6.5 to 7.5. If you amend your soil with plenty of compost, it should be good to go. Just be sure to take a reading, just in case. When planting, space them out at least eighteen inches. They are going to spread a bit over time, so make sure you give them the room they need to do so. Asparagus loves a wet soil, so be sure to give them a heavy watering keeping the ground, soft and moist. In the first two seasons, let your asparagus grow. Do not clip any of them off. They will grow into fern looking arrangements and that is a good thing. This gives your asparagus the ability to strengthen the roots. In season three, your asparagus will be ready to harvest. While you won’t harvest a lot of asparagus, you will still be able to get some to enjoy. I find the best way to harvest the spears is to simply bend them at the base and break them off. You will hear the snap of freshness. The popular varieties include Martha and Mary Washington, however there are number of hybrids, including two developed in my home state of New Jersey by Rutgers University called Jersey Giant and Jersey Knight. If you are a fan of this great tasting veggie, invest the time to grow it. You won’t be disappointed. < Mike Podlesny is the author of Vegetable Gardening for the Average Person: A Guide to Vegetable Gardening for the rest of us, the moderator for the largest vegetable gardening page on Facebook and creator of the monthly Seeds Club. 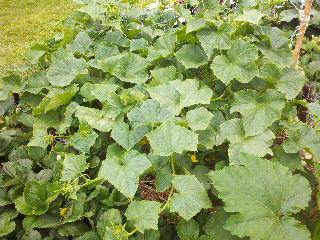 my cucumbers are growing the wrong way... which is away from the trellis ...what do you recommend to do? I am starting a new blog series called “From Seed to Harvest”. In this series I will write about one vegetable, fruit or herb and what it takes to get it from a seed to your kitchen table. I am going to list varying growing conditions, soil preparation techniques and more. My goal is to arm you with as much information as possible to increase your chances of success with the varieties we cover. First up, is the artichoke. Yes, you can grow them in your garden. While they will be much happier in warmer climates, they have been shown to be hardy in as far north as zone 4. Of course the colder your climate the more “tricks” you will need to use to take advantage of shortened growing seasons such as starting them earlier indoors and the use of cold frames. When planting your artichoke seeds, make sure you do not plant them deeper than a quarter of an inch. Although they are a medium sized seed, you want to make sure they can push through the topsoil without much hassle. This depth is irregardless of your starting method. i.e. outdoors, indoors, in a cold frame or via a propagation dome. Your artichoke seeds should be planted in a soil where the temperature exceeds seventy degrees Fahrenheit but not greater than eighty. If you are starting your seeds indoors, a propagation dome is an excellent tool to use to ensure germination in under 14 days. Artichokes are one of those few home vegetable gardening anomalies where the pH is neutral to more alkaline. The best way to increase your soil’s pH level is the use of limestone. The finer the powder of the limestone, the faster it will amend your soil. Before you add anything, be sure to take a reading of your soil’s pH with a soil tester. For your artichokes, you want your soil’s pH level to read anywhere from 6.5 to 8.0, which is a little less than neutral to a little above. If you started your artichokes indoors, just like any other veggie started indoors, you will want to acclimate them to the outdoor temperatures. When daytime temps allow, bring your artichokes outside and then back inside at night when temps drop. This process is also called hardening off. When permanently planting your artichoke starters be sure to give them plenty of room to grow. While you can probably get away with eighteen inches between plants, twenty-four is the recommended space. For square foot gardeners out there that is the equivalent of two squares. Artichokes are heavy feeders so be sure to prepare your soil with plenty of compost, and feed them throughout the season with compost/manure tea or other organic fertilizers. If your artichoke is a nice evenly green color and isn’t open, then it is ready to be harvested. Try not to wait too long as once it begins to open it starts losing its tenderness. Be sure to harvest your artichokes by clipping them off at the bottom. 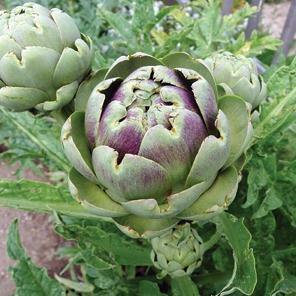 The most popular variety is the Green Globe and for artichokes, sunflowers, and tarragon make for great neighbors in companion planting methods, while following Jerusalem artichokes in a crop rotation, is not a good idea. 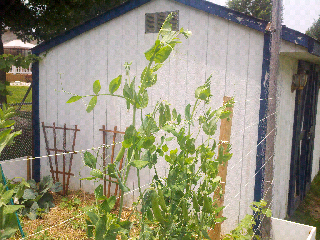 our peas have exceeded expectations this year. they have now grown a foot taller than the trellis which stands about 6 feet tall. how are your peas doing? When you hear the word “high production” the first thought that may come to mind is some type of assembly line work, but what I am referring to is something far more important, especially if you are trying to achieve, or at least get closer to, self-sustainability. I once heard a quote, from which I honestly have no idea who the original author of said quote is, “If one can not feed oneself without help from outside sources, then one won’t survive for very long.” It got me thinking. Is it true? How many things in our lives are we dependent upon from outside sources? Food, energy, water and other basic needs? About the only thing we are not charged for, or told we have to buy from someone else these days is the air we breathe. I better not say that too loud though. But it is very true. Many of us rely upon many of our basic needs from outside sources out of our control. If you are not one of them, kudos to you and please share with us how you did it! Home vegetable gardening is a start along that path to self sustainability. Maintaining a home vegetable garden gives you the chance to learn how you can rely on your own ability and talents, no matter how big or small the garden may be, to supply some of the food your family needs. Over time as you perfect your skills of home vegetable gardening, you start expanding into other areas. For me, it has been a many year progression from simply growing tomatoes, to today, growing everything from tomatoes to grapes, raspberries, dozens of other veggies, fruits and herbs and so much more. This year I added an apple and almond tree (among other things) to my repertoire in the hopes that they provide fresh fruit and nuts for many years. This brings me back to my original point and that is high production. Like some of you, my space is limited. I have only a finite amount of land in which to grow on. So what I have been able to do, by learning over the years is to maximize the space that I have with various techniques to ensure that I am getting the most out of that space. The first of which is planting high producing veggies. In other words, plants that will yield larger volume per plant. Examples would be, cherry or grape tomatoes, zucchini, blackberry and raspberry bushes and so on. This is not to say that you shouldn’t include smaller producing crops such as carrots, beets or turnips. But you can grow them in deep containers, such as pots or window boxes, in areas where the previously mentioned varieties would not fair so well. A second example would be to use vertical gardening methods. The use of a trellis for many varieties will go a long way. 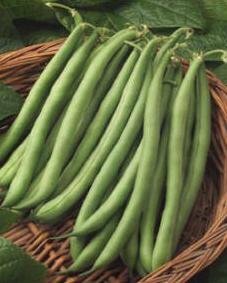 Pole beans, sugar snap peas, indeterminate vining cucumbers are just a few that you can choose from. They satisfy both the use of growing vertically as well as producing large quantities. Double score! Finally, be sure to include high producing perennials such as asparagus,everbearing raspberries, blueberries, or fruit and nut bearing trees to name a few. You can buy a self pollinating apple tree for as little as $20, and although you may have to wait a couple of years before production, once it gets going, you will have apples for decades! Of course if you are new to home vegetable gardening, you would not thrust yourself into doing everything in your first year. Start small and keep your garden simple. Expand on it every season, and it won’t be long before you are supplying not only enough fruits and veggies for your family with loads of fresh tasting goodies, but your neighbors as well. My next conquest is raising chickens. I am told that you need two per each family member in the household to produce ample amounts of eggs. We shall see. self-sustainability here I come! 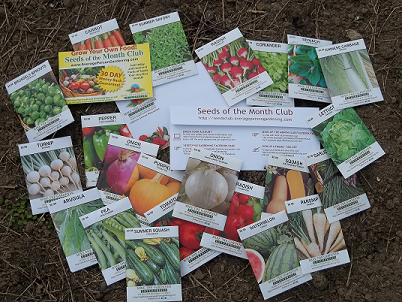 Seeds of the Month Club! Answer a few questions and you will be entered. Contest ends midnight June 30th EST and is void where prohibited by law. We are in precarious times, not only here in the United States but in many places, or should I say most places, around the world. Debts and deficits, turmoil, bad weather, and political bickering is abound everywhere and nobody is immune. Unless, of course, you sit 24 hours a day in a closet, shielding yourself from the great outdoors, family, friends … you get the idea. Same as many of you, we (my wife and two kids) go to the grocery store to stock the fridge and shelves. What we are noticing, as many of you have noticed as well is that “hidden” inflation. Inflation right in front of your eyes is the easiest to spot. We have all seen that as well. You go to buy a gallon of milk that was $3.00 last week and this week it is $3.20. You get the idea. However, hidden inflation, may not be that obvious … at first. I read a fascinating article called the “Oreo Cookie Inflation”. In this article, the author writes about how he previously purchased a package of Oreo cookies and it contained three rows of fifteen cookies each for a total of forty-five cookies. Fast forward to a few weeks after that and the same package of Oreo cookies that cost the same three dollars or so, now had three rows of thirteen cookies each for a total of thirty-nine cookies. Six less than what the author previously received. That is hidden inflation. It’s paying the same price for a product that you perceive to be equal to what you received previously, when in fact, as is the case with this author’s story, six cookies less. The veggies section of your local grocery store is no different. Even though many veggies do not come in packages (although some do), you can be hit with inflation. Whether it be the hidden variety or the price per pound increasing ever so slightly. If you grow your own, though, you really are immune to the price increase. Your tomato, cucumber, pepper, and other plants will produce (varying natural factors a side i.e. insects, weather etc), regardless of the rising cost of fuel or political bantering. 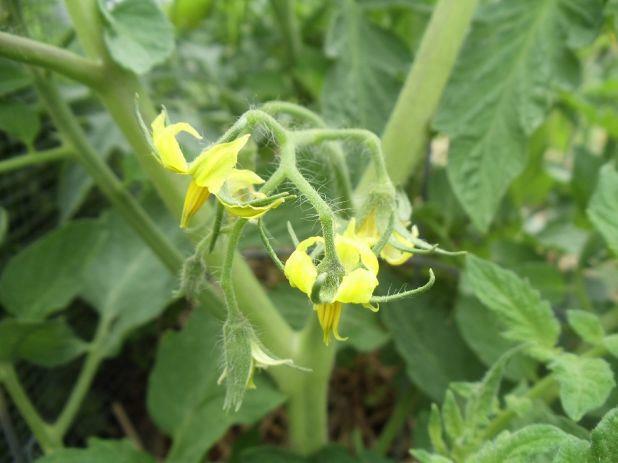 A study conducted by the USDA claimed that one tomato plant can produce as much as $50 in tomatoes. Do you believe that number? I certainly do! Last year my neighbor picked more than fifty pounds of Roma tomatoes from two plants. That’s a lot of tomatoes. Other varieties such as grape or cherry produce in high volume as well. While inflation may make that cost of your seed packet to rise a few pennies, or becomes victim to “hidden” inflation via receiving less seeds for the price you paid before, the cost per seed is still, literally hundredths of a cent per seed. If you can start your entire vegetable garden from seed, select varieties that are high volume producers, learn some canning techniques, you can literally shield yourself from the rising costs of veggies. In my previous article I started writing about the wonderful experience I had conducting a gardening class at my son’s school. To give a brief recap, the first part of the class included reading a book on gardening to the kids, whose ages were 4 & 5 year olds, then we moved on to an actual gardening activity. The gardening activity consisted of showing the kids how the expanding seed pellets work by adding warm water, then they planted a sunflower seed in each individual pellet. They were allowed to take this project home them so they could watch the sunflower grow. As an update. My son’s own sunflower, he was a part of this class, now is about ten inches tall. When completely grown, his Mammoth Grey Sunflower can be as tall as twelve feet, although eight or nine is more common. He enjoys watching it everyday. The second part of the gardening class was the outdoor portion. My son is fortunate as his school has an outdoor garden area that is well maintained. After speaking with the person in charge, the kids were given their own raised bed in the center of the garden courtyard which happens to receive the most sunlight, so I was pretty excited about that. I originally had the idea of having each child plant tomatillos. I thought it was different and would be a lot of fun. After much debate though (debate with myself that is), I decided to go with the old reliable tomato. I changed my mind, because tomatoes are easy to grow, and by the time the school year ends, the plants will be big enough and should have some young tomatoes on it so the kids can actually see what they planted. Not saying tomatillos won’t, but tomatoes ended being a lot easier to explain. I had germinated three different varieties from seeds. They were beefsteak, cherry and roma. I described each of the varieties to the children as follows, big and juicy (beefsteaks), small but tasty (cherry) and shaped like a football (romas). I am sure I could have come up with better descriptions, but felt these hit the point home with the age group I was working with. Can you guess which variety the kids chose the most? Post a comment with your answer. The kids came over one by one and chose the variety they wanted to plant. Working with each child, one at a time, they dug a small hole and planted their tomato. I think what was just as fun was watching some of the other kids, simply play in the dirt while they waited their turn. One young man even dug a hole about 2 feet, in record time, mind you, until the teacher asked him to stop. Of course by then he had found a worm or two, and lets just say the “chasing the girls with worms” then ensued. We planted a total of 16 altogether. Each plant was marked with a garden marker in which they wrote their names on previously. The teacher’s plan was to bring the students back out into the garden before the school year ends so that each child can check on the progress of their plant. Of course the school garden is open even when the school is not (on Saturday’s only), so parents and students are welcome to come back and harvest what they grew. It was a rewarding experience. Before I had left, the kids put together a little thank you for me for coming in, by placing their thumbprints on a piece of construction paper, with their first names written underneath each print, and then giving their prints some eyes so as they looked like little bugs. I have that picture hanging on my office wall. A gift so simple, yet it means so much. If you ever have the chance of doing something similar for your own child’s class, I say do it. It’s a lot of fun and rewarding.